Since 1994, Jamie Sadock has been providing golf pieces with buoyant colors, fun patterns, and novel silhouettes. This season, Jami Sadock is giving women golfers a minor way to get colorful on the golf course. Here are some of the newest Jamie Sadock Terra Blues golf pieces that will help you show your personality a bit more. All of these golf pieces can fit a small to medium body frame. Enjoy FREE SHIPPING when you buy any of them! The Jamie Sadock Ladies Cap Sleeve Golf Shirt is not just a traditional golf shirt you can find anywhere. It has eccentric crinkle prints with a lovely combination of colors such as Turquoise, Navy, Lavender, Green and White. Artistically spread all over the fabric, the crinkle print design gives slender bodies a magnificent fit while maintaining great mobility in the arms. This shirt has an adorable front placket and an artistic roll collar design in a bold print. Made of 100% Polyester, it is very comfortable to wear and very cool especially during warm weather days. 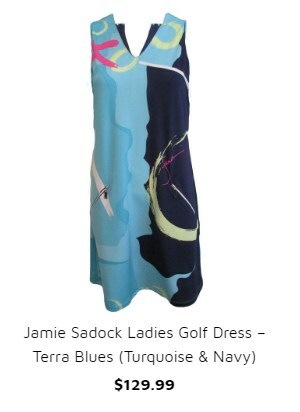 The Jamie Sadock Ladies Golf Dress is the best pick if you want to dress for success. This dress has everything you need for a comfortable fitting and remarkable golf game experience. It has a satisfying V-neck design, two front zip pockets and a breathable fabric that is made of 92% Polyester/8% Spandex. The 35” length from the shoulder to the hem is ideal for small to medium body frame. Anyone in search of electrifying golf attire will fall in love with its unique abstract design and rivet details on the neckline. The Jamie Sadock Ladies 24” Airwear Golf Capri Pants is the best way to tee up and channel the classic look in you. This navy blue Capri Pants is a perfect blend for both printed and solid color golf tops. Made of 87% Polyester/ 13% Spandex, it helps you achieve a stylish and breathable fit. It has two zip front pockets, tee pocket on the left and one back pocket which will give enough space for golf balls and other important golf accessories. With its hemlines falling just a few inches below the knees, the Jamie Sadock Ladies 24” Airwear Golf Capri Pants is ideal for optimum swing control and ease of movement. Aside from its awesome fitting, it is very lightweight making it an excellent choice for summer golf. It is time to unleash the real energy needed to win! Don’t let these electrifying Jamie Sadock Tierra Blues golf pieces pass your wardrobe. Tis the season to be jolly! So brace yourselves to be the eye-candy of the golf course while wearing this Jamie Sadock Caramel collection and a Cleopatra long sleeve jacket. This Jamie Sadock Caramel collection offers two short sleeve golf shirts with equally appealing styles that will definitely suit your taste. The first one is a Jamie Sadock Ladies short sleeve golf shirt that is made of crinkle material and hasa black mandarin collar and gold accents. The colors are in various shapes that give a youthful, fun and bubbly style on this golf shirt. It has a zip front placket in bold colors of black, cinnabar, Cleopatra red and light blue. The second one is a Jamie Sadock Ladies Short sleeve golf shirt. It also has mandarin collar and gold studs in it. It also has a zip front placket in thedominant colors of bold black, caramel and Cleopatra red, styled with animal print on it. It gives a wild and aggressive fashion sense on the golf shirt. It is also feather weight, climate control comfort and wrinkle-free. Also add this Jamie Sadock Ladies Long Sleeve golf shirt to these golf shirts. This Cleopatra red long sleeve golf jacket complements the red and black splash on the mentioned golf shirts. It also has gold studs that add glam to whatever you wear. So feel free to pair it with whatever collection you have in mind. It has three gold rings on right chest area and bold black accent on the bottom of the left arm. There’s also a gold zipper closure on both arms. Like Cleopatra, golf wars may wage for the battle of your attention, beauty and exquisiteness. Pair these golf shirts with either a golf short or a golf pants. Both are in caramel and complement the base color of the golf shirts. The 19” Jamie Sadock Ladies &Plus Size Melody golf short has two zippered front hand pockets, one rear snap pocket and two metal pockets clasp closure at either side above hemline. It also has a zip fly with button closure and belt loops. While the Jamie Sadock Ladies Angelica golf pants is a 41.5” stretch fabric triblend with belt loop waist, buttoned front closure with zip fly, zippered front pockets. Check out the other new ladies golf apparel for this season at www.lorisgolfshoppe.com. Or visit Lori’s Golf Shoppe at Calabash, NC. Feel the breathtaking Tahiti ocean while wearing this Jamie Sadock Tahiti collection. It offers three unconventional golf shirts and a golf Capri. All items are in shades of Tahiti purple. The first Jamie Sadock Ladies & Plus Size Short Sleeve golf shirt is a short sleeve golf top in bold Tahiti Purple with splash of black and silver. It also has a rollover collar with decorative silver studs and zip front placket.. The second one is a Jamie Sadock Ladies Short Sleeve golf shirt. This short sleeve golf polo has Tahiti prints in bold colors of yellow, purple and black. It also has a mandarin collar and zip closure with tee holder on left sleeve. While the third golf shirt is a Jamie Sadock Ladies Short sleeve golf shirt in wild Tahiti prints in grey, black, purple and silver. It also has mandarin collar and zip closure. All these innovative Jamie Sadock golf shirts are made from climate control and wrinkle free material and have UPF30. All are worth $88.99 each. You can pair any of these golf shirts with this Jamie Sadock Knee Golf Capri, truly a manifestation of the Jamie Sadock comfort and fashion. 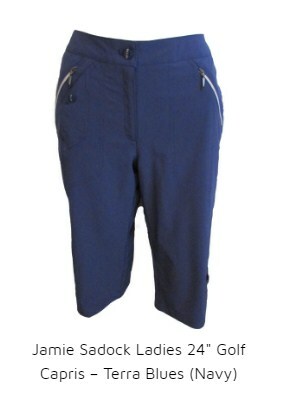 It is 24” golf Capri with belt loop waist, buttoned front closure with zip fly. It also has four zippered front pockets with lower welt pockets. It also has a zippered back pocket with stacked welt pocket. For more of electrifying Jamie Sadock collection, you may check out www.lorisgolfshoppe.com. Also visit Lori’s Golf Shoppe at Calabash, NC. Midori is another stunning Jamie Sadock collection of ladies golf wears. Midori is a Japanese term for green and is also a popular sweet and bright green-colored muskmelon alcoholic beverage. So this Midori collection naturally gives a taste of sweetness to our lady golfers. 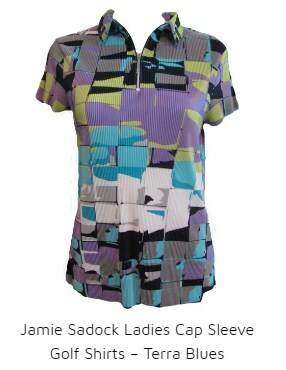 This Jamie Sadock Ladies Short sleeve golf shirt is beautifully colored in Midori and has patches/prints of black. It is short sleeve golf top with black mandarin collar. It is made of 92% Polyester 8% Spandex. The other Jamie Sadock Ladies & Plus Size short sleeve golf shirt has a black mandarin collar with silver accents and has a zip front placket. It has vibrant colors of mystic blue, grey, black and yellow. It is made of 100% Polyester. Match any of the mentioned golf shirts to this Jamie Sadock Ladies Capri. This Midori-colored Capri is 24” in length and is made of nylon, rayon and spandex fabrication to provide comfort and flexibility. There are also silver accents on the belt loops and on the four zippers in front plus the back pocket. Interested in other Jamie Sadock collections? Check out http://lorisgolfshoppe.com/ and place your orders there. 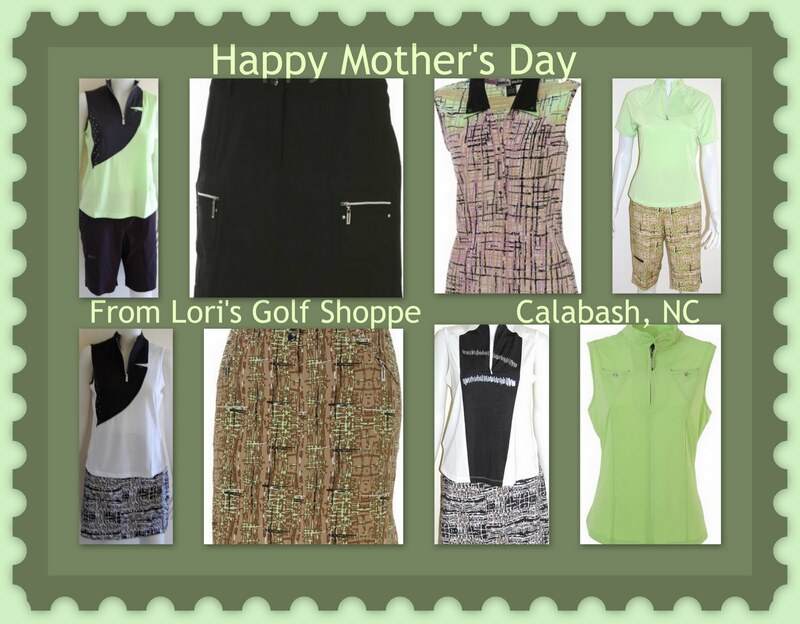 Or, you may want to check out Lori’s Golf Shoppe at Calabash, NC. Have you ever felt that you’ve been wearing the same golf outfit as the rest of your lady golf friends? There’s nothing wrong with that but we also dare you to be beautifully different, to stand out among everyone else. Jamie Sadock is a famous brand name in ladies and plus size golf wear that showcases bold, dynamic and unconventional collections, like this Fizz collection. The Jamie Sadock Fizz collection has a sophisticated mix of colors matched with bold prints perfectly combined in each of the ladies golf shirts. These Jamie Sadock Ladies Sleeveless Golf shirt s– Fizz are made of crinkle material golf top with black mandarin collar and gold accents and with zip front placket. The first sleeveless has an attractive share of cinnamon and lime with accents of blue, black and bronze on it. Another sleeveless has a graffiti type of print. It has random shapes and splash of cinnamon, black, blue, fuchsia and gold. For the Jamie Sadock golf shirts, there are two short sleeve shirts and a long sleeve shirt that you can choose from. First is the the Jamie Sadock Ladies Short Sleeve Golf Shirts– Fizz. It is like the short sleeve version of the print and materials of the Fizz Sleeveless golf shirt. The other Golf shirt is the Jamie Sadock Women’s Plus Size Golf shirt. The irregular splashes of cinnamon and blue can add up to the slimming look while wearing this golf shirt. It has mandarin collar and gold accents with front zip placket. Another Jamie Sadock Women’s Plus Size Long Sleeve shirt is included in this Fizz collection. It keeps you sun protected as you walk your way to the holes. It has UPF 30+, climate cool comfort and wrinkle free material. It also has underarm mesh, metallic zipper front placket and mandarin collar with black accents and gold clips. And hey, you can also put your tee on the pocket on the left arm. Though the Fizz collection may have electrifying colors and styles, the golf shorts and skorts are way beyond simpler in style but the elegance remains in them. This cinnamon-colored Skinnyliscious Pull-on Golf skort is a gypsy skort with double zip pockets on the left side. It also has one zip pocket in the back with undershorts and side zipper on the right side. And yes, the zippers here do the fashion trick. If you are more comfortable to play wearing golf shorts, choose this Jamie Sadock Melody Golf short. This 19” Cinnamon-colored short has two zippered front hand pockets and one rear snap pocket. It also has two cargo pockets with a metal clasp closure, zip fly with button closure and belt loops. In this case, the pockets do the functionality and fashion in this golf short. Ignite yourself for more Jamie Sadock collections you can view and order at lorisgolfshoppe.com. Also visit Lori’s Golf Shoppe at Calabash, NC. Truly in a class all her own, Jamie Sadock defies conformity. Ms. Sadock epitomizes quality and innovation in an avant-garde sort of way. She has the ability to create elegant concepts with unusual color combinations to set her apart from her competition. Her designs break through traditional parameters making her creations easily identifiable; thus, Sadock Sightings! Her artistic f oundation in men’s and women’s resort wear has people clamoring for her products. Jamie Sadock apparel, shoes and accessories are on display now at Lori’s Golf Shoppe located northeast of the South / North Carolina border in Calabash, North Carolina. Lori’s carries a complete line of Sadock products at affordable prices. Professional sales associates are readily available to help you make the perfect selections. If you prefer shopping from home, just log on to Lorisgolfshoppe.com to browse over 5000 sports related items for men, women and children. You’ll find additional savings at checkout as free shipping is offered for orders over $100 when shipped within the continental US. Join the thousands of individuals who visit the retail shoppe or online store each year to find the latest in golf and tennis attire, equipment and accessories. When entering “Lori’s World” you’ll find everything you need to bring your game to the next level. After all, Lori’s Golf Shoppe is the place Where All Golfing Gals Gather for the latest in everything golf! 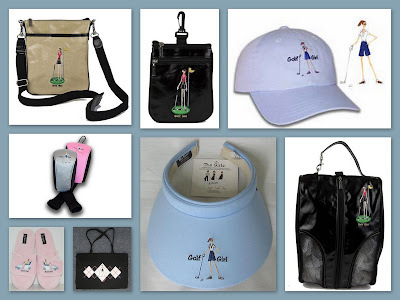 Show your commitment to the game of golf with this series of “Golf Girl” accessories. The “Golf Girl” logo is unique in its design and adds a personal touch when you venture out on the course. Easy to coordinate, these accessories can be paired with any of the ladies’ golf fashions or ladies’ golf cart/stand bags that you’ll find at Lori’s Golf Shoppe or Lorisgolfshoppe.com. Keep all your golfing essentials handy with these 100% cotton canvas clip-on ladies’ golf pouches, ladies’ golf shoe bags, or shoulder purses and totes. The fine quality craftsmanship includes a polka dot lining and full top closure zipper. In some cases, additional exterior zip pockets are also available. The shiny silver hardware adds a little “bling” to the style! You’ll also find the ladies’ one size fits all caps or visors to be most comfortable to wear. The ladies’ golf cap is comprised of cotton canvas with a velcro back. Donning the ladies’ flexible cotton visor makes it comfortably wearable for 18 holes of golf … no headache with this brand! Add the embroidered Golf Girl design and it speaks to your enjoyment of the sport. Head covers always add a little flair to your golf bag. This signature collection of black micro suede and neoprene material will provide you with years of good service. The patented carabineer clip and nylon knit sock will fit drivers of 400 cc club size. This package also includes two fairway wood head covers. And when all is said and done, and those 18 holes have been won, who wouldn’t enjoy slipping into a pair of K-Bell Golf Girl Slippers? There’s no better way to relax and kick your feet up at home than with these K-Bell Golf Girl Slippers. A micro suede upper and plush terry lining keep your feet cushioned and comfortable. The Golf Girl motif embroidered on the ivory slippers’ uppers provides a fun, feminine touch. Lori’s Golf Shoppe or Lorisgolfshoppe.com just knows how to do it right! All of these items can be easily purchased as you browse through this predominately ladies’ golf store located in the heart of Calabash, North Carolina. You’ll find helpful sales assistants and golf professionals who will assist you in coordinating your golf fashions and selecting your golf equipment. Golf lessons and clinics are available for all ages and all genders throughout the four seasons. Be sure to stop by Lori’s Golf Shoppe or Lorisgolfshoppe.com as it is “the place” where Golfing Gals Gather for fun and friendship! Jamie Sadock speaks for herself! 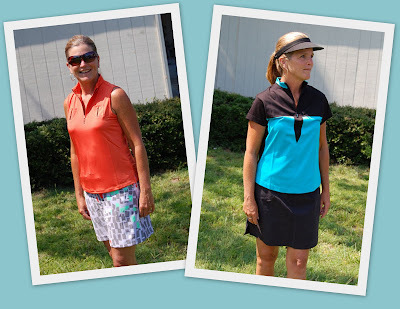 Have you ever noticed how easy it is to pick out a Jamie Sadock ladies’ golf outfit? The apparel is uncommon and easily recognized by sight as being a “Jamie Sadock.” This ladies’ golf apparel can be termed elegant, contemporary, artistic and diversified with a very consistent taste level. Jamie Sadock is the founder and president of the cutting edge resort wear/sportswear company that bears her name and is one of the leaders in the golf industry. Shown above are two of the many “Sadock” styles that can be found at Lori’s Golf Shoppe or on-line at Lorisgolfshoppe.com. Attention to detail transforms the skort into a modern look, with two front zip pockets and one back pocket. On this basic sleeveless shirt, details are highlighted with two small zip pockets. Princess seams on front provide for a flattering and stylish fit. The lightweight “Cooltron” fabric wicks moisture from your skin keeping you cool and dry. These are great ladies’ golf outfits for on and off the course. While shopping at Lori’s Golf Shoppe for the Sadock line, you’ll also find a wide selection of ladies’ golf shoes, ladies’ golf bags, ladies’ golf totes and cooler bags, ladies’ golf balls, markers and visor clips. Lori’s Golf Shoppe offers ladies’ golf equipment, club design and repair. Be sure to stop by Lori’s Golf Shoppe, located in Calabash, North Carolina, or shop on-line at Lorisgolfshoppe.com for the latest in ladies’ golf apparel and instructional clinics. You’ll find that Lori’s is the place “Where All Golfing Gals Gather“!